When catastrophic life events happen, it can feel like the world is ending. Finding light in the darkness is the hope. In Rachel Bonds’ Sundown, Yellow Moon, a time of uncertainty is explored through the perspective of an assortment of individuals. A co-production between Ars Nova and Women’s Project Theater, Sundown, Yellow Moon is sadly lost, much like the characters. Exploring the idea of loss and letting go, Sundown, Yellow Moon by Rachel Bonds, with music by The Bengsons, captures the aftermath of a group of individuals displaced in life and relationship. Twin sisters and Joey and Ray, return home to take care of their father after he is asked out of his teaching position. 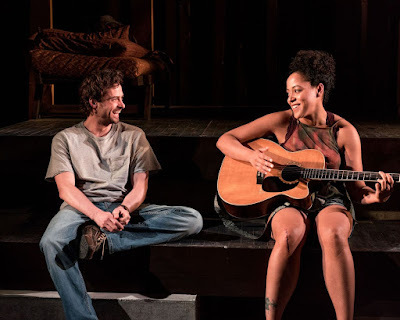 As they find solace in his tiny backwoods home, Ray comes to grips with the loss of her job while Joey grapples with whether her Fulbright is worth leaving for. Congruently, Carver, an old acquaintance of the girls, is trying to be Tom's support as Ted Driscoll, a prolific poet, meanders into the woods and finds comfort with Joey. And then there is Jean and Bobby, neighbors whose sole purpose is to play some music since this is a play with music. Packed into a single act, Sundown, Yellow Moon provides insufficient information that leaves you unfulfilled. Bonds showcases some intricate intimacies through some stunning scene work. The content of her writing is beautiful. But as an overall structure of a play with a clear beginning, middle, and end, she falters. When Joey, Ray, and Tom have their family music moment leading to the black out, you sat there wondering what exactly this play was about. Bonds has some glimmers of great potential. Carver is a stunning character. But we don't get a complete arc for him. Carver could easily have his own play. Bonds is strongest in her theatrical duets. We see a big group scene that only drops hints of important plot. She could easily transplant the necessary information and place them in other scenes, fleshing out relationships. This would also help to eliminate the superfluous characters in Jean and Bobby. With a feeling of uncertainty, Anne Kauffman didn't help the story move. Kauffman directed the piece at a sluggish, cinematic pace. She did, however, capture the intimacy within the blooming relationships. She was able to explore the dependency of human connection through the proximity of emotional attachment. The set by Lauren Helpern provided Kauffman exploratory playground for staging but the installation proved difficult. The installation was evocative but costly to the world of the play. Creating distinct locales within the singular, multi-tier set caused limited movement within the scenes. Called a nighttime play, lighting designers Isabella Byrd and Matt Frey and sound designer Leah Gelpe capitalized on this. The darkness of the forest companied with the evening creatures captured the ambiance of the environment. Sundown, Yellow Moon focused on the dynamics between Joey, Ray, and Tom. Each family member had their own set of problems and dependencies. As the twins, Eboni Booth and Lilli Cooper as Joey and Ray respectively found the extremities of their dynamic. Booth’s Joey was high-strung longing for a release, ultimately getting her vulnerability pulled out from under her. Cooper gave the laxer of the sisters a mature edge, trying to prioritize her litany of complications. Peter Friedman’s Tom struggled with pride, often exploding out of frustration. Carver is a beautifully complex character, layered through his dark history. He is more than a brooding boy longing to break free from the past. Facing Carver head on, JD Taylor spellbinding performance was a highlight of the production. Rachel Bonds has a beautiful voice and a beautiful perspective. Sundown, Yellow Moon, just wasn't the right showcase for it.